Note: This recipe was developed by me for use in the Three Hierarchs Chapel at St. Vladimir's Seminary. You can reduce it in proportion for your own use. I will include photos when possible. What is striking about this bread is that the loaf will bake brown while the dough decorations will bake white, which creates a striking but very tasteful appearance. The Besan and Chapati flours can be obtained in Indian or Middle Eastern markets. Besan helps keep the dough dense but not soggy (along with a great flavor), while the Chapati is by far the finest grade of brown flour I have come across. Other whole wheat flours don't compare. The flavor is hard to describe, but everyone here approves. Best of all, it is lenten and so it can be used year-round. Thank you to Vicki Dean for giving me tips on how bread is decorated in her home parish of St. Sava Serbian Orthodox Church in Fresno, CA. This recipe makes 10 loaves. This photo should give you some idea of what you create using this recipe. From left, a wheat stalk design, grape vines and olive branches. See diagrams at bottom of page to show you how to make these (it's easier than it looks!). Active Dry Yeast - 1 1/2 Tbsp. Dump everything into a bowl, except the water, and stir thoroughly. Add water until you have a stiff bread dough. If you add too much water, don't be afraid to add more flour. This isn't nuclear science. Knead the dough for 20 minutes. Set it aside to rise for 1 1/2 hours or until double in volume. Don't forget to cover the dough. 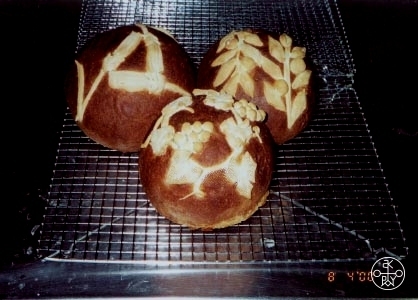 While the bread is rising, mix the dough for the decorations. It should be moderately dry. Let is set after kneading for 15 minutes. Make sure you knead it for 20 minutes so that is is nice and elastic. Otherwise, it will be sheer agony to work with. After the decoration dough has set, cut a piece of wax paper and set it next to your floured work area. Cut and equal size piece of plastic wrap to act as cover. Roll out the decoration dough to the thickness of two nickels. Cut out your decorations and set them on the wax paper, then cover with plastic wrap. Once the bread dough has risen, preheat the oven for 325°. Take the dough out and punch it down. Shape the loaves into balls (x10) while working out all the air bubbles, then arrange them on the baking sheet. Leave plenty of room between each. Pat them down so that they are not more than 1 1/2" high. Damped the outside of the bread, then lay the decorations on the bread. Make sure the pieces of decorative dough have good contact with crust. Cover each loaf with plastic wrap when you are finished decorating. Let the loaf set for 15 minutes before baking. Bake at 325° for 45-50 minutes. There are three kinds of decorations we use at the Chapel on our Artos: grapevines, olive branches and wheat stalks. Shake a little flour on the wax paper, and make sure you lay your pieces on the waxy side. Don't let them set for too long: dough can stick to anything if it sits long enough. Keep your work covered with plastic wrap, otherwise it will get a cracked skin. You have the advantage over bread dough in that this dough has no yeast, so it won't rise as you work with it and distort. Roll the dough to the thickness of two nickels. Shoe-lace strips of dough (not tennis shoe wide, but thin) become stalks or vines to which fruit and leaves are attached. To make small offshoots (tendrils in the case of grapevines), just cut a long notch into the branch and stretch the piece out on the loaf. Curl it like a grapevine tendril and stick it down. To make grapes, I punch the dough with a pen cap. If the dough sticks in the cap, I blow through the hole at the top of the cap (make sure you have an airhole to blow through). 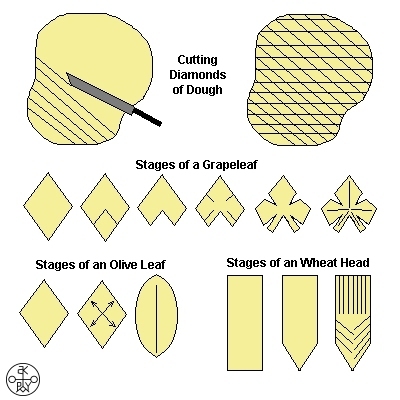 For the leaves, I make long lateral cuts through the dough, then turn the blade and make another series of cuts creating a whole series of diamonds (see diagram ). For grape leaves, cut a small diamond out of one long end of a diamond. A few cuts along the side and tugging at the corners will form the natural shape of the leaves. When sticking leaves to the loaf, I run a knife along the vein lines of the leaf. It not only helps it stick, but gives the leaf internal contours which make it more realistic. Get a jar of grape leaves and unfold one if you need help visualizing where to make the cuts. Olive branches are made with simple stems covered with diamond leaves. Tug the leaves on the sides to get rid of the smaller corners and so they have a rounded appearance. Use small balls, slightly flattened, for olives. Don't try pushing in a life-size ball of decoration dough: it will turn rock hard in the baking process and later will trouble the birds it ends up being fed to. To represent a head of wheat, cut a 1/2" x 1 1/2" stripe. Cut off the corners to make arrows out of both ends. Run the knife from the middle to the top multiple times to make the "hairs" on the end of a wheat stalk. Cut a thin strip of dough for the shaft and stick it on the loaf. Stick the wheat head on top. Take your knife a cut a series of 'V' down the rest of the wheat head, then cut it down the middle, which will give you the appearance of grains. Keep your loaf covered when not working with it. Before you try to stick something to it, make sure the surface is still tacky. Rewet if necessary.